I picked this book only because of Neil Gaiman. Even though this was just a commencement address made by him in the year 2012 at Philadelphia’s University of the Arts, I knew I would enjoy it immensely and I did. There is something about such speeches that are so positive, that it makes you want to believe in a better world for one and all. I remember feeling the same when I read George Saunder’s speech on kindness in the form of a small book, “Congratulations, By the Way”, and this time it was a speech on making good art, aptly titled, “Making Good Art”. “Make Good Art” speech is all about making good art and the purpose of art in our lives and generations to come. He encourages all artists – from painters to writers to musicians, to do just one thing – break all barriers and think out of the box (I know it is clichéd but it works) and make good art. That is all there is to it. The book is a small one and doesn’t take time to finish, however, for the words to seep in, especially if you are an artist, means that you have read and reread it. You have to be one with what Gaiman says and the advice he dispenses. I love Chip Kidd’s illustrations and the ones that he does in this book, just blend effortlessly with Gaiman’s words. “Make Good Art” is for everyone out there who have wanted to create something. It is about successes and failures and how it will not be an easy road every time you decide to create art. “Make Good Art” is perfect to be gifted to one who is confused about what he or she should do in life. It is a read for all of us. 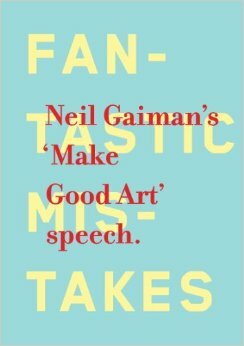 This entry was posted in Books, Hachette Book Group, Headline Review, Neil Gaiman, Non-Fiction, Review and tagged hachette, Headline, Make Good Art, neil gaiman, Philadelphia, University of Arts on February 1, 2015 by thehungryreader. Another Neil Gaiman that I read this month and loved it as much as “Hansel and Gretel”. This one is called “The Sleeper and the Spindle”, takes on Sleeping Beauty and Snow White. This one I found better than “Hansel and Gretel”, maybe because I have loved these two fairy tales most as a child. 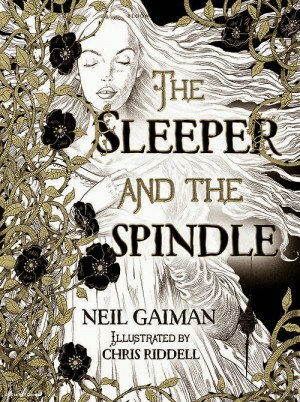 “The Sleeper and the Spindle” is again fascinating because of the illustrations by Riddell and the tales weaved by Gaiman. “The Sleeper and the Spindle” is a fun read. It is not a light reader but neither is it as dark as “Hansel and Gretel”. The stories are just the same with some twist here and there, but what really will make you want more as a reader are the illustrations of Chris Riddell. They are stupendous and beautifully drawn. Neil Gaiman’s storytelling is inventive. The stories merge together and as a reader you are just fascinated by the writing style and narrative. This one is also creepy but not so much. There are a couple of minor changes but that is passable in the name of creativity. It is a dark and innovative spin that you must read and reread for the illustrations. A short read for a lazy Sunday. This entry was posted in Bloomsbury Publishing, Books, Fairy Tales, Graphic Novel, Neil Gaiman, Review and tagged bloomsbury, Chris Riddell, Fairy Tale, Graphic Story, neil gaiman, The Sleeper and the Spindle on January 25, 2015 by thehungryreader. We have all read and loved “Hansel and Gretel” when we were growing up. Everything about fairy tales was fascinating and intriguing. Nothing could take away the beauty of a good fairy tale, so much so that its macabre underlined meaning was lost on us. 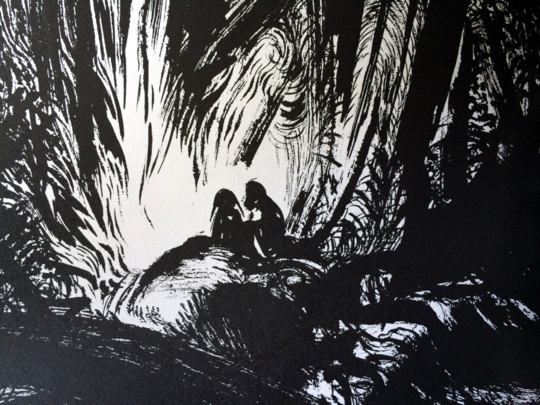 Neil Gaiman’s “Hansel and Gretel” does not drift away from the real story at all. It stays true to it and yet there is something about this version that both your dreams and nightmares will be made of. 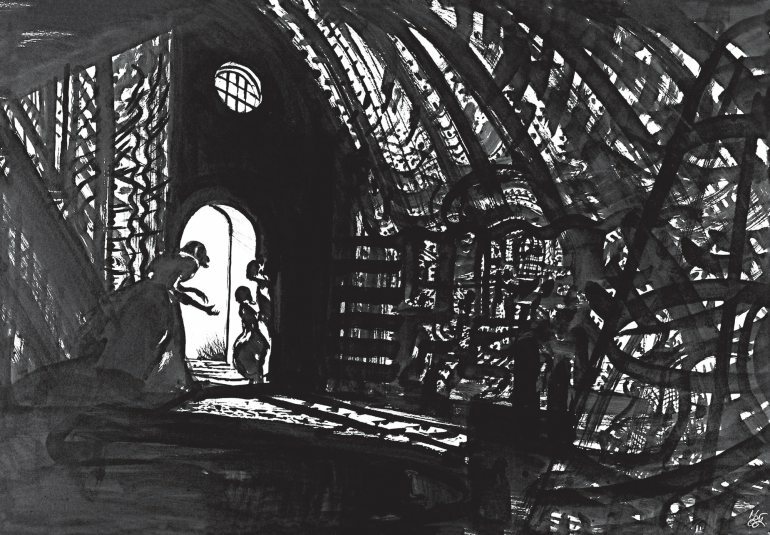 “Hansel and Gretel” tells the tale of a brother and sister and yet there are so many layers to it – of poverty, the parents’ role in sending the children away, the witch but obviously and the children with their intelligence and wit. What makes this edition so unique of course are the wonderful illustrations of Lorenzo Mattotti. They are dark, brooding, and melancholic to the core. They are of course wonderfully done. And while others might say that it is too dark, it is really not that dark. The book delivers creepy fantastically. The images are in black and white, so that is another twist to it. 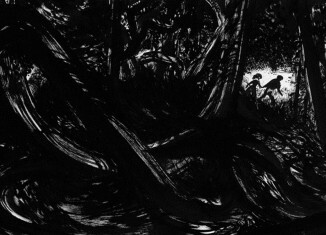 “Hansel and Gretel” is a delight to read, even if it is just fifty-six pages long. There is something redeeming and at the same time something so unforgiving about this tale, that it will make you think over and over again. We have all heard it in our childhood, but I feel that for most stories, different versions are always welcome. They somehow change your perception as well, over time and years to come. 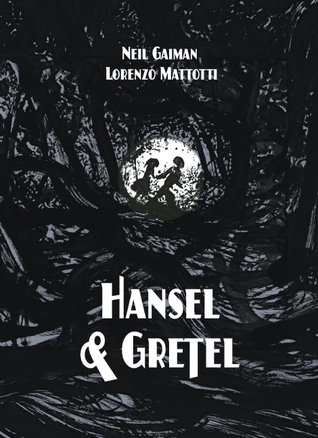 “Hansel and Gretel” is a work that is beautifully reproduced by Gaiman and Mattotti and a definite read for both children and adults. Also, please ensure that the children have read the earlier Grimm’s tale as well, more so for literature’s sake. This entry was posted in Authors I Love, Bloomsbury Publishing, Books, Fairy Tales, Fiction, Graphic Novel, Neil Gaiman, Review and tagged bloomsbury, Fairy Tale, Fiction, Graphic, Hansel and Gretel, Lorenzo Mattotti, neil gaiman on January 24, 2015 by thehungryreader. It was a pity that I had not read, “The Graveyard Book” yet. I had it with me for years and never got around to reading it. Like I always keep saying and believing in it: The time was not right. I was not prepared or right enough to read that book. Books choose you when they want to; otherwise reading them will just be another futile attempt. I guess it would have been that way with “The Graveyard Book” had I read it that time. 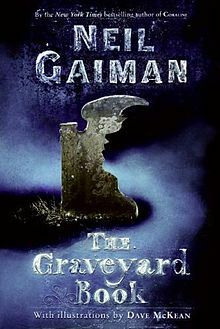 “The Graveyard Book” by Neil Gaiman has it all – the elements of fantasy, which most of his other books also do possess. For me though, the storytelling of this one was beyond his other books. Nobody Owens is at the centre of this book, when his entire family (parents and sister) are brutally murdered one night in their own home, by a man, simply known as Jack. Nobody is but an infant and somehow manages to escape and find refuge in a nearby graveyard, where the spirits roam at night, with not a care for the world. Mister and Mistress Owens (a spirit couple) decide to adopt the infant and that is how he gets his name – Nobody Owens, Bod for short. There is something known as the “Freedom of the Graveyard” which not only gives Bod access to the graveyard and all its ways and passages, but also protects him as long as he is in the graveyard. Jack obviously will not be satiated till he kills Bod. He comes back after years to finish the unfinished job and that is where the crux of the story lies. Actually, I take that back. The crux of the story lies in the spirits in the graveyard, in the mysteries of the graveyard and how a living boy is actually adopted not just by two spirits but by the entire graveyard and Silas – his Godfather – who neither belongs to the living or to the dead. I found the descriptions in the book (which were also funny at most times) of great interest. Gaiman has a knack for details – as a reader, you will imagine each and every line written. This I guess comes from him being a graphic novel writer as well. He can just somehow visualize to the hilt and transfer the power to the reader. The plot is extremely tight and the read is a fast one for sure. The book I guess has no age barrier – it can be read by anyone, of any age and that is where the beauty of the writing actually is. You will fall in love with Bod and the other characters. In fact, Liza Hempstock, the witch was my personal favourite. I am most happy that I read this as a part of my “The Novel Cure Reading Challenge” and will definitely reread it sometime later. “The Graveyard Book” is a book which will warm your heart and also make you instantly want more of it – a sequel for sure, I hope. This entry was posted in Authors I Love, Books, fantasy, Harper Collins, Neil Gaiman, Review and tagged adoption, Books, harper collins, neil gaiman, Review, The Graveyard Book, The Novel Cure Challenge on November 20, 2013 by thehungryreader.